Food safety has fast become one of the nation's top issues. Three thousand people die each year in the U.S. from foodborne illnesses. Another 48 million are sickened annually and our government fails to protect us. 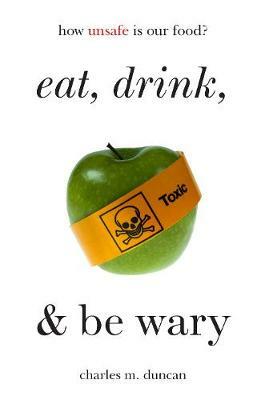 Many foods and additives that we eat every day have been banned for years in other countries. Our government food safety agencies move in reverse--cutting back on inspections, allowing food producers to inspect themselves, and permitting the vast majority of potentially adulterated foods to enter this country without benefit of any testing or inspection. How, in a country so advanced in most areas, could we have descended to this alarming state of food safety? One answer: Budget cuts and bureaucrats. Eat, Drink, and Be Wary examines the multitude of dangers in food production, transportation, storing, and preparation that result in this shocking number of preventable illnesses and deaths. It takes a broad and detailed look, in all food groups, at the problems and potential solutions in food safety practices, inspections, and enforcements. This book answers the questions and concerns of millions of Americans who have reached new levels of serious doubts about the safety of our food. Charles Duncan points readers to the dangers to look for in deli foods, raw milk, seafood, poultry, eggs, beef, and others. For consumers who care about the food they eat, this book details the dangers, offers direction for choosing safe foods, and provides a critique of our current system that suggests ways it can be fixed, or at least improved.